A jury ruled that Google did not violate Oracle's patents with its Android operating system. NEW YORK (CNNMoney) -- In one of Silicon Valley's landmark court battles, Google appears to have won a big victory over Oracle. 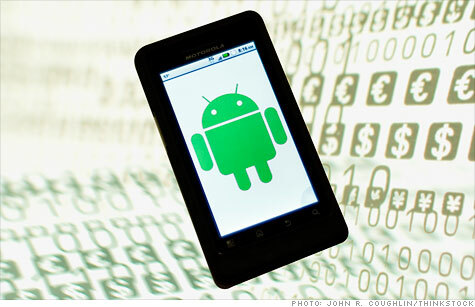 A jury on Wednesday cleared Google of violating any of Oracle's patents with its Android mobile software. Oracle had claimed that Google's Android infringes two patents that Oracle holds on its Java software, a ubiquitous programming language powering everything from phones to websites. "Today's jury verdict that Android does not infringe Oracle's patents was a victory not just for Google but the entire Android ecosystem," a Google (GOOG, Fortune 500) spokesman said. An Oracle (ORCL, Fortune 500) spokesman did not immediately respond to a request for comment. The jury was dismissed, and Oracle will not be eligible to collect any damages from Google for patent infringement. That's a major development. Oracle was seeking a payout of millions. But the case isn't over. The court still has to resolve a mixed and confusing verdict from an earlier phase of the trial, focusing on copyright issues. In the copyright phase, which wrapped up on May 7, a jury found that Google infringed on Oracle's copyrights of Java and some of its application programming interfaces (API) -- essentially a way for apps to talk to the operating system. But the jury shied away from saying Google actually did anything wrong. It was hung on whether or not Google's violation could be considered "fair use" -- making the infringement legal -- because Java is open-source software, which means its is generally free and available for public use. Google's lawyers argued that fair use and infringement are "two sides of the same coin," and moved for a mistrial. It also believes that APIs are inherently not copyrightable, a matter of law that Judge William Alsup is expected to rule on now that the patent phase of the trial is complete. Much more than the patent phase of the trial, that's the ruling that could send shock waves through the tech industry, which makes heavy use of open-source code. A ruling in Oracle's favor would cast a serious shadow over Android, the industry's most dominant mobile software system. Following his ruling on the copyright issue, the judge is expected to rule on Google's request for a mistrial. Oracle may be entitled to some damages from the copyright violation, but it's unlikely that the company will get anything close to the tens of millions of dollars it was seeking in retroactive licensing fees. The corporate software giant picked a fight with Google because it felt that Android is threatening the Java platform it got as part of its blockbuster $7.4 billion Sun purchase. Android may be an off-shoot of Java, but its interface and functionality is unique. Code written for Java is not inherently compatible with Android -- and as Android grows, its version of Java threatens to become the dominant one. Oracle wants to force Google to play by its rules and make Android compatible with the rest of Java. Then, developers would be able to write apps around Java's programming interfaces that would also run seamlessly on Android devices. Despite Wednesday's verdict -- and no matter what the final outcome is on the mistrial -- this is unlikely to be the final decision. The companies are expected to appeal, and this case could get held up in court battles for years.